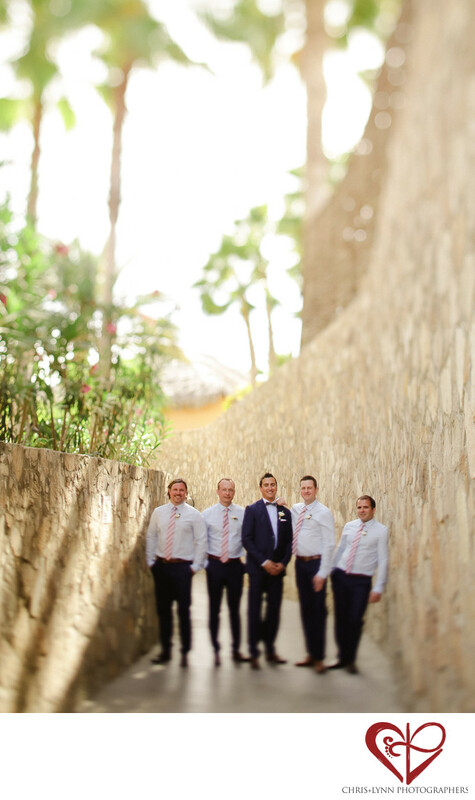 Wandering through the Esperanza Resort, the groom and his groomsmen stop for a photo opportunity on a pathway. On either side, beautiful walls of rock lead up to gardens and palm trees. In the middle, the groom stands out from his groomsmen with his handsome dark blue sport coat by Etro. At his side, the groomsmen smile. Their pink ties match the pink flowers in the garden above them. All five of these men look classy and elegant as they make their way down to where the ceremony will take place overlooking the ocean. The tall trees and unique layout of the Esperanza Resort offers a variety of places to take photos while still remaining secluded.